Maple Leafs players celebrate after a goal by Jake Gardiner (51) late in the first period of a 4-2 win over the Coyotes. GLENDALE, Ariz. (AP) — Coming off a four-game losing streak, the Toronto Maple Leafs put an emphasis on getting off to better starts. They’ve been doing just that, and it’s led to their longest win streak in seven years. Jonathan Bernier stopped 39 shots and the Maple Leafs used a fast start to spark another big scoring night, beating the Phoenix Coyotes 4-2 Monday for their first five-game winning streak since 2007. "It feel great and feels great for a goalie, too," Bernier said of getting off to fast starts. "That’s our main focus; we know if we score the first goal in this league, you have a good chance to win." With Bernier making some tough saves early, Toronto jumped out to a 3-0 lead by early in the second period. 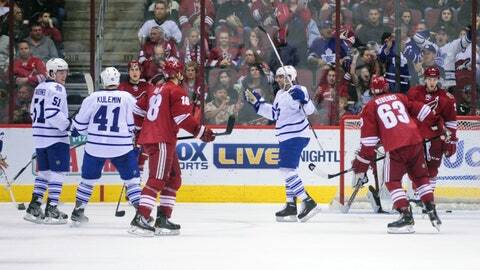 The Maple Leafs withstood a flurry of shots by Phoenix thanks to some tough saves by Bernier and some near-misses by the Coyotes, and they pulled away for their fifth straight win for the first time since Jan. 27-Feb. 6, 2007. Phil Kessel had a goal and an assist to extend his points streak to six games. Jake Gardiner and Nazem Kadri also had a goal and an assist, and Carl Gunnarsson scored his first goal in nearly a year. Buoyed by their fast starts, the Maple Leafs have scored 20 goals during their winning streak. "We feel this group can continue to grow and play to a higher level — enough talking about it," Toronto coach Randy Carlyle said. "Action speaks louder than words, and we have to continue to challenge this group to play better and become a playoff team." The Coyotes had plenty of chances. Most of them were turned away by Bernier, a few by the goal posts, and numerous others just missed the mark, leading to a frustrating loss. Phoenix matched a team record by scoring a power-play goal for the eighth straight game when Mike Ribeiro scored early in the third period. Antoine Vermette added a short-handed goal, the Coyotes’ first of the year. "It’s disappointing," Vermette said. "We felt out there we had a lot of great scoring chances and we had a good night, but it went to them." The Maple Leafs followed their four-game losing streak by pouring in goals during a four-game winning streak. They kept it rolling against the Coyotes, scoring two goals in 2:02 late in the first period. After both teams traded good scoring chances, Gardiner scored by gathering a loose puck out front and beating Mike Smith from close range. Phoenix defenseman Zbynek Michalek then went to the penalty box for sending the puck over the glass in his own end, and Kessel capitalized on the ensuing power play, scoring his 24th of the season with a shot from the left circle that had some help from a screen by James van Riemsdyk out front. Gunnarsson made it 3-0 with his first goal since Jan. 24, 2013, knocking down a shot from Dion Phaneuf with his foot in front of the crease and beating Smith to the stick side. The first two periods were filled with near-misses for the Coyotes: Lauri Korpikoski hit the crossbar in the first period, Oliver Ekman-Larsson hit the post in the second and Shane Doan couldn’t corral a stretch pass for a breakaway. Phoenix had numerous other shots just miss the net, and Bernier made some spectacular saves, including a sliding stop on a one-time by Ekman-Larsson on a power play. The Coyotes had 27 shots on goal and 16 shots that missed through the first two periods. "Their goalie was playing well," Coyotes coach Dave Tippett said. "I think he was fortunate to have a few pucks hit the crossbar and things like that, but when you’re having a night we were, those bounces go the other way." Phoenix finally broke through on a power play early in the third period, when Keith Yandle found Ribeiro at the side of the net and he tapped it past Bernier into the open side of the net. The Coyotes had a slew of penalties after that, and Kadri cashed in on the third one with his first goal in 12 games to put the Maple Leafs up 4-1. Vermette scored Phoenix’s short-handed goal after that, but it wasn’t enough. NOTES: Coyotes C Martin Hanzal, tied for the team lead with 14 goals, did not play and is listed day to day with a lower-body injury. … Kessel and Coyotes RW David Moss, who are cousins, played against each other in the NHL for the eighth time. … Toronto won at Phoenix for the first time since 2003, a span of four games. … Yandle extended his points streak to four games with his assist on Ribeiro’s goal.